A Championship football club has offered its support to a youth team who walked off the pitch after a player was allegedly racially abused. Ipswich Wanderers under-18s will be the guests of honour at Ipswich Town's match against Birmingham on Saturday. The match is the Blues' dedicated "Kick It Out" game, when they make a stand against racism in football. Suffolk FA is investigating claims a fan at Framlingham Town shouted "racist abuse" at a Wanderers youngster. 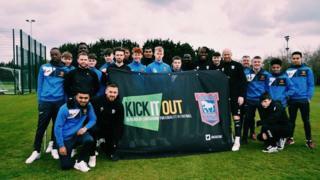 Dan Palfrey, a media spokesman from Ipswich Town, said he was "completely shocked" that racism could happen at under-18 level. He said: "It was such a big talking point and it really needs to be stamped out of football. "They are such a local team to us and it being under-18s as well... and I thought Ipswich Town being the [professional] club in the county, we need to offer our support." The Wanderers players were also invited to Ipswich Town's training session on Friday. The youngsters have been given free tickets to Saturday's match and are due to hold up the "Kick It Out" banner as the teams emerge from the tunnel. Jonty Boon, the Wanderers U18 coach, said: "They're really excited about it and really looking forward to it. "It's a shame it's under the circumstances that it is, but it's a massive privilege for us as a club." He said there seemed to be a trend of racism in football and "there was absolutely no need for it". Mr Boon said the player in question was back playing football for the team, which the club was "delighted" about as "he is a great player". Tottenham's Danny Rose has said he hoped governing bodies will "discuss how to eradicate" racism in football. Racist chanting was directed at several England players during a Euro 2020 qualifier in Montenegro.